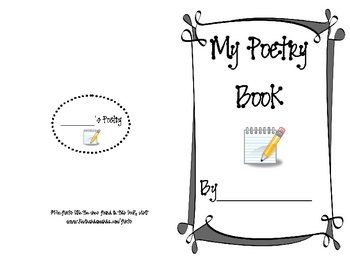 Perfect for 2 & 3 Graders (a 4th grade teacher in my building said she'd use it as a poetry unit intro), this poetry book contains 6 different kinds of poetry: Acrostic, Alliteration, Cinquain, Five Senses, Color Poem, and Couplets (kids simply complete the rhymes already on the page). On each page there is a simple definition of the poetry type, an example, and room to "Try it out". Students will need to fold or cut the book pages in half to put it together. I got the awesome fonts for my book from www.kevinandamanda.com. They make the book more appealing to youngsters!